Last year, Dale Jr had some problems in the practices. He also got in an accident during the race and finished 28th. Hopefully he’ll fair better this year (he needs it after how his season has gone). 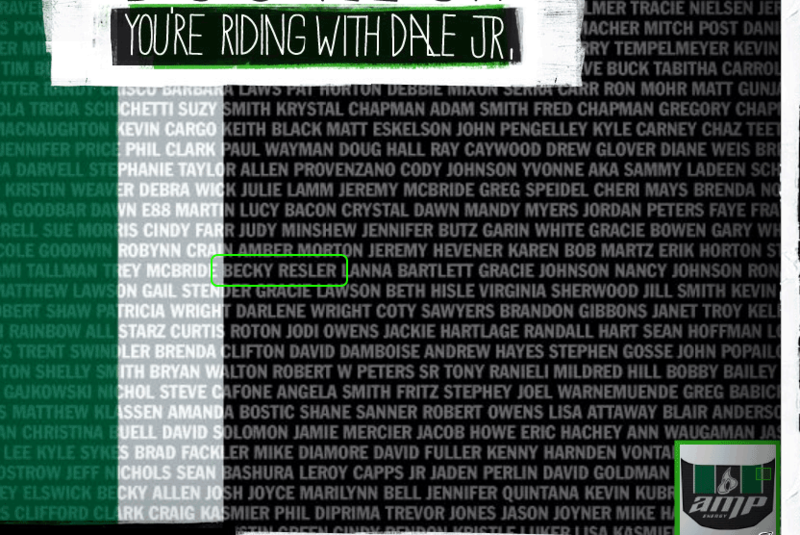 It would be better if I was actually at the racetrack for race weekend, but it is cool that my name is on a racecar in the race. My Dad signed up too (copycat :razz2: ). His name is on the truck deck lid. The race is Sunday afternoon. Hopefully at the end of the race Dale Jr will be in Victory Lane. Maybe Dad & I will be his good luck charms (along with the over 70,000 other people who have their names on the car).